Just on the other side of the eastern edge of Kathmandu Valley lies the town of Kushadevi. It is a two-hour drive from the capital, yet this district is an example that proximity to a hospital is not all that is required for many Nepalis to receive adequate medical care in the aftermath of the earthquake. While a lot of attention went to districts like Sindhupalchok and Gorkha, Kavre got left in the shadows even though the damage here was extensive. Of Kushadevi’s 1,900 home, 1,700 were damaged or destroyed. Fortunately, because of the timing of the quake on 25 April, there were only five fatalities. 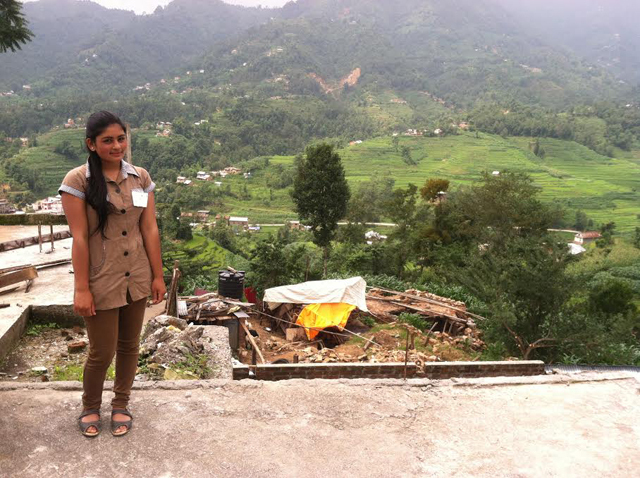 Sarmila Sapkota lives with her family in a house overlooking Kushadevi which was damaged in the quake. They live on the ground floor where the livestock used to be. The buffalos and goats have been moved to a temporary shed. Sapkota’s bedroom was on the second floor, and the walls have caved in. Just down the road from Sarmila’s house are piles of bricks where family homes used to be. Next to them are temporary structures covered in tin or plastic sheets. 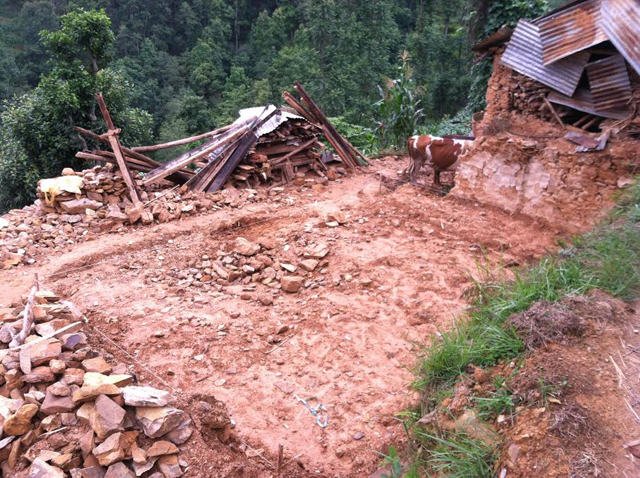 Uma Sapkota’s home is in ruins and she is trying to rebuild it, but isn’t getting much help from anyone. Uma Sapkota’s home in ruins after the April 25 earthquake. Aside from shelter, one urgent need is medical care. And even though Kushadevi is only a 45 minute drive from Dhulikhel Hospital, villagers don’t want to leave family alone at home. Which is why the role of mobile clinics like the one provided by volunteer doctors from Kathmandu’s B&B Hospital and the Hospital and Rehabilitation Centre for Disabled Children (HRDC) in Banepa are so important. The group has set up over 60 clinics where people can be examined, have their tests done and receive free medications. They even get psychosocial counseling and transport to nearby hospitals to receive surgeries free of charge if they need them. 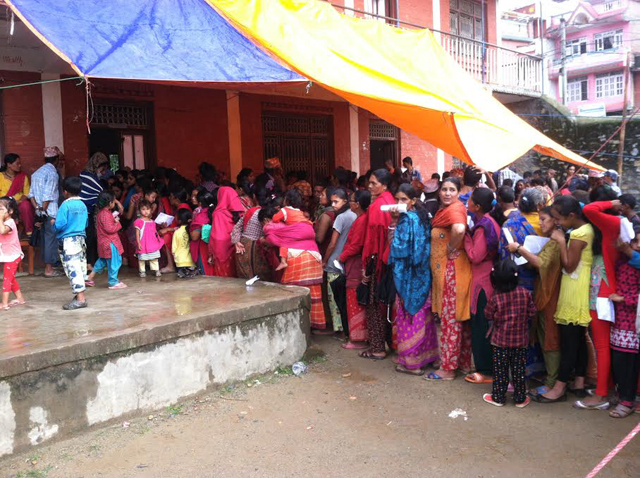 “We have seen a trend in the past two months acute earthquake related trauma to chronic ailments,” explained Bibek Banskota, a volunteer doctor. The earthquake related injuries are now giving way to preexisting ailments and those made worse by the quake. For example, there is a long line of women in the room where pregnant women are being examined. Many have not been able to see a doctor three times during their pregnancy as recommended. On one recent Saturday, the volunteers examined over 1,500 patients. Most chronic injuries are treated with a prescription from the group’s traveling pharmacy. The doctors and nurses are all volunteers from B&B and HRDC, and each clinic costs Rs 500,000 for the medicine, food and a transport allowance to patients who have to walk a long way. Nearby is another camp run by the Karnali Integrated Rural Development and Research Center (KIRDARC) which provides psychological counseling for children. 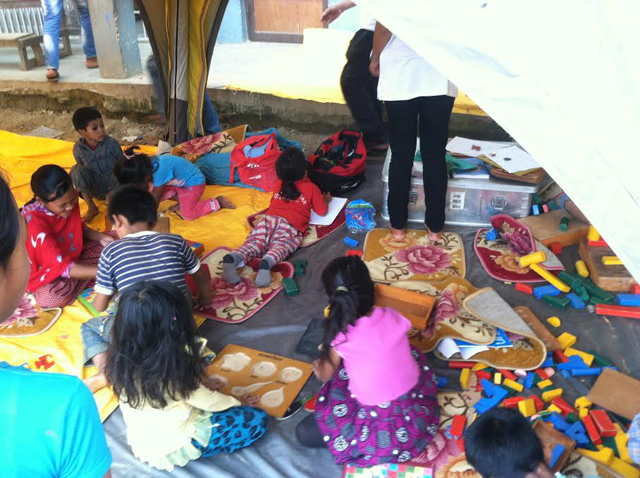 A tent outside is full of children playing while waiting for parents to be treated. Trained counselors observe the children playing, and provide help if they notice abnormal behavior.